This week in Trump’s shrinking, chaotic regime it became even clearer that Trump answers to no one but himself. He continues to attack and attempt to intimidate Republicans into submission, as part of his continuing efforts to consolidate power. White supremacists and neo-Nazi leaders cheered Trump’s “on many sides” comments, taking his words as a defense, or even as a tacit approval, of their action. On Sunday, the WH issued a statement to “clarify” Trump’s Saturday comments, saying Trump condemns all forms of “violence, bigotry and hatred” while naming white supremacists, KKK, and neo-Nazis. 32 year-old Heather Heyer was killed Saturday after a car driven by James Fields rammed into a crowd of counter-protesters in Charlottesville. Nineteen others were injured. Daily Caller and Fox News deleted a post titled, “Here’s A Reel Of Cars Plowing Through Protesters Trying To Block The Road,” which included a video encouraging people to drive through protests. Two state troopers, Lieutenant Jay Cullen and Trooper Berke Bates, who were keeping watch on the demonstrations in Charlottesville, were killed when their helicopter went down. Neo-Nazis disparaged Heyer, and the KKK celebrated her death. Neo-Nazi website The Daily Stormer was taken down after activists, led by my Sunday tweet, contacted domain hosts GoDaddy, Google, etc. After US hosting companies refused to host The Daily Stormer, the website briefly relocated to Russia, for which they thanked Trump, before being kicked off there too. China rebuffed them too. In the wake of Charlottesville, numerous tech companies including Facebook, Google, Spotify, Uber, Squarespace, and many others took action to curb use of their services and platforms by alt-right groups. A Unite the Right organizer was disavowed by his family. Several marchers who were identified on social media lost their jobs. Others were asked to denounce their activities or were expelled by colleges. On Sunday, Trump’s popularity hit a new low at Gallup with 34% approving and 61% disapproving (-27). On Monday, Jeff Sessions said the car ramming into Heather Heyer and 19 others “does meet the definition of domestic terrorism” under US law. Later Monday and Tuesday, four more CEOs resigned from Trump’s American Manufacturing Council over his handling of Charlottesville. Trump countered, “I have many to take their place. Grandstanders should not have gone on.” Trump offered no new names publicly. On Wednesday, NYT reported the CEOs on Trump’s Strategic and Policy Forum held a morning conference call to discuss whether to disband the policy forum. The Manufacturing Council planned a call that afternoon. Before the policy forum, and possible manufacturing council could formally disband, midday Wednesday Trump tweeted “rather than putting pressure on the businesspeople,” he was ending both. On Thursday, the WH announced the Presidential Advisory Council on Infrastructure, which was still being formed, would not move forward. Minutes after the Phoenix mayor’s statement, Trump tweeted a link for tickets to his Phoenix event. Advocates said there has been a spike in reports of anti-LGBTQ violence since Trump took office. As of August, there are already more hate-related homicides than in all of 2016, excluding Pulse. A Virginia high school sent a letter to parents saying selection for AP and Honors classes would be at least partly based on race. On Monday, the Holocaust memorial in Boston was vandalized for the second time this summer. On Tuesday morning, Trump tweeted then deleted an image of a train running over a CNN reporter. On Tuesday at Trump Tower, with Mnuchin, Chao, and Cohn by this side, Trump turned what was supposed to be remarks about his infrastructure plan into an “off-the-rails” news conference on Charlottesville. Reversing himself for the fourth time in four days, Trump said “I think there’s blame on both sides” — insinuating that the “alt-left” was just as much to blame as white supremacists and neo-Nazis. Trump claimed alt-right protestors had a permit, but counter-protesters “came charging in without a permit” and “were very, very violent.” WAPO gave the claim that counter-protestors had no permit 4 Pinocchios. Trump equated taking down the statue of Robert E. Lee in Charlottesville to taking down statues of Washington (“George Washington was a slave owner”) and Jefferson (“Because he was a major slave owner”). Politico reported Trump was “in good spirits” Tuesday night, and felt the “new conference went much better” than his Monday speech. Mnuchin’s Yale classmates wrote an open letter calling on him to resign immediately, saying Trump “declared himself a sympathizer with groups” whose values are antithetical to Yale and decent human beings. In a Republican primary in Alabama Tuesday, Trump’s chosen candidate Luther Strange, whom he very publicly supported, came in second. On Wednesday, Pence cut his international trip to Central and South America short to come home. The stated reason was to join a national security meeting on Friday, although rumors flew with other theories. On Wednesday, Fox News’ Shep Smith said his show “reached out to Republicans of all stripes across the country today” and couldn’t find a single one willing to come on and discuss Trump’s Tuesday comments. On Wednesday, the Generals of the Army, Navy, Air Force, Marines, and National Guard tweeted to condemn the racist violence in Charlottesville, declaring the nation’s armed forces unequivocally against hatred. Sen. Bob Corker, one of Trump’s first senate supporters who was also under consideration for VP, said Trump “has not yet been able to demonstrate the stability nor some of the competence” to be a successful leader. Rep. Steve Cohen of TN, a ranking member of the House Judiciary Subcommittee on the Constitution and Civil Justice, introduced articles of impeachment in response to Trump’s comments on Charlottesville. USA Today Editorial Board called on Congress to censure Trump for his “shocking equivocations about the white-supremacist,” challenging Republicans to “stand up for American values” or be Trump enablers. On Thursday, the Cleveland Clinic pulled their 2018 Florida gala from Mar-a-Lago. Cleveland Clinic had held their event there for eight years. By Friday evening, 16 charities had pulled their events from Mar-a-Lago, costing the Trump Organization hundreds of thousands, or possibly millions in lost revenues. Citing violence at Charlottesville, Texas A&M and the University of Florida cancelled scheduled speaking appearances by white supremacist Richard Spencer, both citing safety concerns. On Thursday, Michigan State University denied a request by Spencer to rent space on the campus for a September event. Students and graduates of Lehigh University students petitioned trustees to revoke Trump’s honorary degree, citing Trump’s “both sides” remarks. At a funeral for Heather Heyer, her mother, Susan Bro said, “They tried to kill my child to shut her up. Well, guess what? You just magnified her.” Bro told NBC Thursday she has received death threats from hate groups. Bro said she will not meet with Trump after he blamed “both sides” for violence in Charlottesville. She also has not picked up his phone calls. The great-great grandchildren of Robert E. Lee, Jefferson Davis and Stonewall Jackson called for Confederate statues to be removed. They also condemned the white supremacist and violence in Charlottesville. In the days following the Charlottesville alt-right rally, 13 US cities and Duke University said they would remove Confederate monuments. Several other cities are considering same. Countering Trump, McConnell offered his “full support” for Flake. James Murdoch donated $1 million to the Anti-Defamation League in the wake of Charlottesville. As many of social media noted, Fox News played a major role in stoking the hate of far-right extremists. According to government documents published by one of Murdoch’s newspapers Tuesday, Australian authorities denied a bid by Trump to build a casino in 1988 due to his ties to the mafia and organized crime. HuffPost reported on Trump aide Katharine Gorka’s role in helping to pull DHS funding for Life After Hate, a group dedicated to countering neo-Nazis and white supremacists, as noted in Week 33. Of note: also in Week 33, the State Dept’s anti-Semitism monitoring office was shuttered. In an interview Thursday, former VP Al Gore said if he could give Trump one piece of advice, it would be to resign. On Friday, the 17 remaining members of Trump’s presidential arts and humanities panel resigned Friday in protest over his Charlottesville comments. Trump’s WH responded late Friday, saying Trump was going to disband the arts and humanities panel anyway. NBC called this week Trump’s “worst week yet,” and said he was more isolated than ever. Hope Hicks took over as the interim WH communications director, as Trump continued his search to replace Scaramucci. Hicks is the fourth person in that role. Trump’s DOJ issued a warrant to DreamHost demanding the company turn over all IP addresses related to DisruptJ20.org, a website used in planning actions to interrupt Trump’s inauguration. NYT reported Mueller, for the first time, is seeking to interview past and current members of Trump’s WH beyond Manafort, including members of the communications team. Mueller is interested in interviewing Priebus about what occurred during the campaign and in the WH, especially as it relates to the June 2016 Trump Tower meeting and the Comey firing. During a press conference on his visit to Colombia, Pence told reporters he “never witnessed” any evidence of Russian collusion with the Trump campaign, and that he was “not aware” of it ever having occurred. WAPO reported Trump aide George Papadopoulos, starting in March 2016 with an email headed, “Meeting with Russian Leadership — Including Putin,” repeatedly tried to get Trump aides to meet with Russians. Experts on Russian intelligence speculated his email chain offers further evidence that Russians were looking for entry points into the Trump campaign. Papadopoulos said he was acting as a Russian intermediary. NYT reported on an investigation by Ukrainian investigators and the FBI of a Ukrainian malware expert named “Profexer,” for his part in a network of hackers allegedly engaged by Russia to hack the US election. Also under investigation is a Russian government hacking group, Advanced Persistent Threat 28 or Fancy Bear, believed to be involved in the DNC hacking. Much of the work was outsourced to private vendors. In the first known hitch, Mueller’s special counsel lost a top FBI investigator, Peter Strzok. It is unclear why Strzok stepped away. A US District court judge ruled that as part of a libel suit brought by Webzilla CEO Aleksej Gubarev against BuzzFeed, Steele could be questioned about the funding and sourcing of the dossier. Rep. Dana Rohrabacher, an advocate for the Kremlin, said he plans to brief Trump on his meeting with Assange. Assange told Rohrabacher that he was not behind the DNC hack, and that the Russians were not involved. The National Parks Service reversed a ban on plastic water bottles at national parks. The move came after confirmation of Trump’s Deputy Interior Secretary, who previously represented Deer Park Water. In a tweet, the Trump Organization featured a photo with the caption, “From our Presidential ballroom to intimate historic room,” to advertise meeting and event space. Raising ethical concerns, Justice Gorsuch is scheduled to address conservative groups at Trump Hotel DC in September, less than two weeks before the court will hear arguments on Trump’s Muslim ban. Mattis’ Department of Defense parted ways with senior media adviser, Steve Warren. Pentagon reporters have complained about lack of access to Mattis, and some recently being kicked off Mattis’s Middle East trip last minute. On Friday, Trump friend and ally Carl Icahn resigned as a special adviser to Trump, although Icahn had done nothing in that role. The WH said Icahn had been fired on Monday. Trump tweeted photos from Camp David of him signing the Global War on Terrorism War Memorial Act. Of the 14 people at the signing, there was only one woman and not a single person of color. In new interviews, Bannon said he viewed the post-Charlotte racial strife and turmoil as a political winner for Trump. On Friday, Trump fired Bannon. According to Bannon allies, he submitted his intention to leave the WH on August 7. Bannon told the Weekly Standard, “The Trump presidency that we fought for, and won, is over,” saying Trump will not achieve his campaign promises. Bannon vowed to continue the fight from the outside. In an op-ed titled, “I Voted for Trump, And I Sorely Regret It,” past avid supporter Julius Krein wrote of his disillusionment with Trump, and the realization that Trump would not achieve his stated goals. Right-wing radio host Rush Limbaugh backed white nationalists and told his 26 million listeners that America is on the “cusp of a second civil war,” blaming international financiers who are trying to bring down America. On Saturday, Boston hosted a Free Speech Rally organized by conservatives and libertarians at Boston Commons. Friday, Mayor Walsh said 500 police officers would be there, and urged people to stay away. Thousands of counter-protesters marched through downtown Boston to condemn white supremacists and neo-Nazis. Police estimated more than 40k counter-protesters peacefully marched. 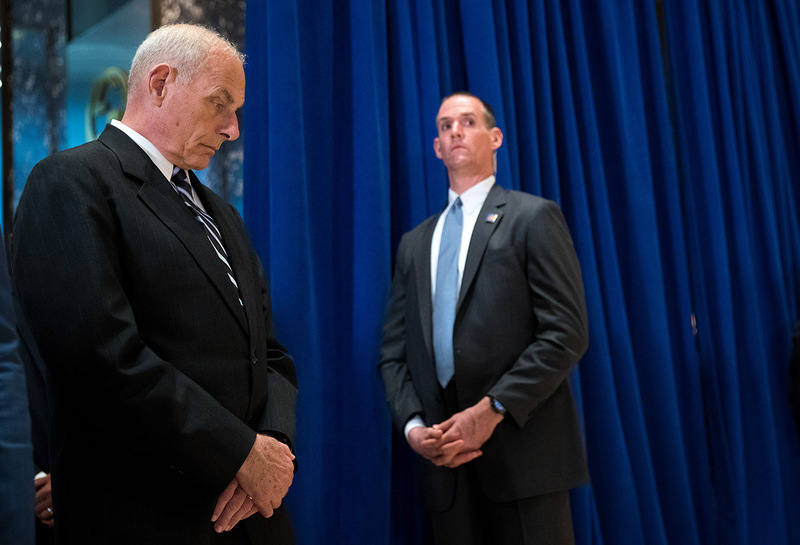 Kelly listens as Trump goes off-script on infrastructure to discuss Charlottesville.